No. 24, Jalan TS 6/6, Taman Industri Subang, 47510 Subang Jaya, Selangor, Malaysia. 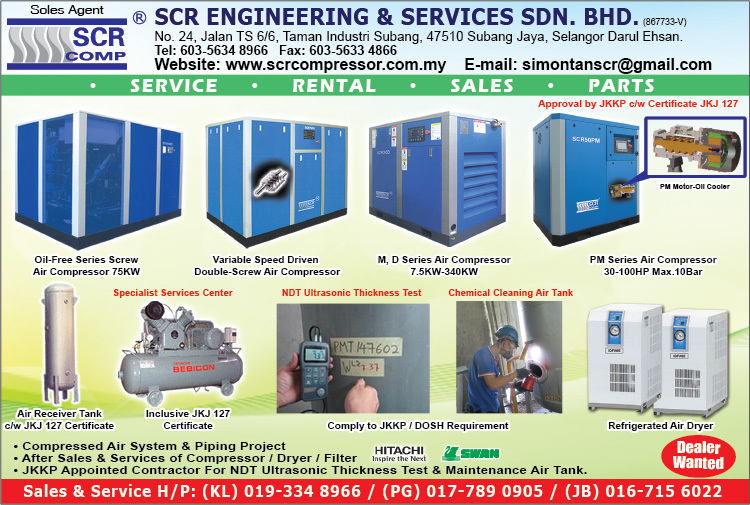 Established at 10th August 2009, SCR Engineering & Services Sdn Bhd distribute the highest quality product line of compressors including stationary, portable, oil-free, various speed driventype compressors and relevant compressed air system products. All of our products are designed for reliable performance, easy maintenance, and maximum energy efficiency. At October 2009, we obtained the status as the authorized distributor and service contractor for SCR Compressor from Shanghai Screw Compressor Co.,LTD China. In less than 3 years time, we has been selling more than 200 units of SCR Air Compressor in Malaysia market. We're committed in bringing you the best out of your air compressor needs, as well as providing top class after sales services to you. SCR Compressor is supplying different purposed compressors and equipments in the industry, which have the advantages of high performance and low operation costs. SCR's innovative solution such as frequency conversion and energy saving technologies are developed in order to assist customers to achieve their long term goals. With a full range of innovative optimal screw compressors including high pressure, micro oil and movable types, SCR compressor is surely your best choice for your air compressor.